As part of my thesis project, I am creating a short documentary film that is a blend of video footage and interviews that document how the Brazilian martial art and dance form of Capoeira acts as a form of healing movement to cultivate community and foster resilience in youth. The interview process started last winter and the interviews consist of both student participants as well as master teachers from as far away as Brazil and as close as Maine, where I live and train Capoeira. The primary focus of my research is emotional trauma from loss. When I started out in my research of how healing movement can cultivate community and foster resilience in youth to help heal emotional wounds, I learned that there wasn’t much existing documentation out there to pull from, and therefore needed to create my own. Throughout the interviewing process, I was able to capture this research and document it through video. Along with these interview clips, I’m beginning to blend them with video footage I’ve collected over the years, from Brazil, California, New York, New Jersey and more. In order to capture a wide variety of style and teaching methods, as well as student diversity, I was able to travel to many different states and meet new and experienced students. I think there are lots of arts-based programs that currently exist that allow youth to heal and grow from their practices. My goal is to show that not only the movement of Capoeira does this, but also the natural combination of music, language, singing, and instrument playing that is also vital to the art form. Together, the movement and arts work together to create room for healing and growth. In other martial arts, there is no music component that exists. In some visual and creative art forms, there is no music. In some dance forms, there is no language component. The list goes on, but my contribution to the greater community is that the art form of Capoeira and its unique blend of arts, allows it to naturally be a healing method for emotional turmoil. There have been many magical moments during the creation of this documentary film, some being the answers that I’ve received during the interviews. Although I had a goal of receiving answers to my questions that would help in my research, I learned about different perspectives and view points from the interviewees. 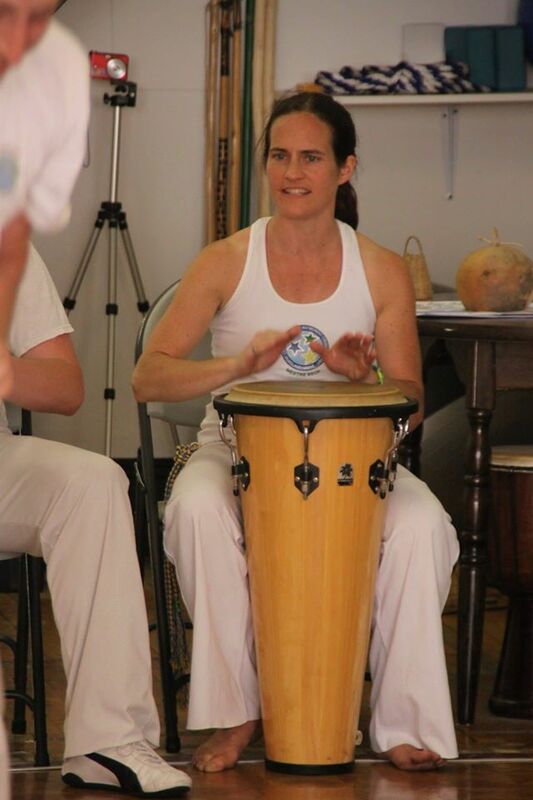 I also learned that many of the interviewees have had a personal experience or trauma that had led them to find Capoeira as a means of self expression and personal healing. I didn’t find this surprising, but rather interesting and exciting as that is the path that led me to this art form—the loss of my mother. The more and more I speak with people and learn about their life experiences, the more I learn about how traumas have impacted their lives and what they did for themselves in order to move forward from sometimes horrific and life-changing experiences. This is the work that I hope to help children and youth with in the near future when my degree at Goddard is complete. Goddard holds a special place in graduate education, in my opinion. I don’t feel that I would have been able to do this work at another college or in another program. Goddard has given me the opportunity to evolve within my research and path, and this is something I greatly appreciate. As we all change and evolve in our personal lives, it was important for me to know that my educational path evolved with me, and was fully supported by all of the advisors that guided me along the way. Growth, expansion and evolution are encouraged, and because of this and the support of the faculty and advisors, I feel it makes for a very rich experience and education that you can’t find anywhere else. All of the residencies that I’ve been to have opened my eyes and mind to new topics, meeting new people and seeing new perspectives. The low-residency model has also been a perfect match for me as I am able to work on my own at home with the energy and support I’ve received from the residency. The friendships I’ve forged over the past couple years have such strong bonds, and we all work to support each other throughout the semesters. The Goddard experience is truly profound and has made me a stronger thinker, writer and researcher. This entry was posted in Arts-Based Inquiry, Cultural & Cross-Cultural Studies, Filmmaking, Transforming Trauma and tagged Capoeira, Pamela McGrath. Bookmark the permalink.